216 pages | 10 B/W Illus. 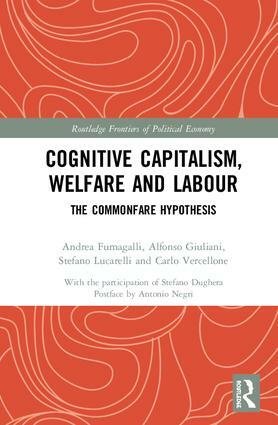 This book deals with the transformations of both accumulation process and labour in the transition from a Fordist to a cognitive capitalism paradigm, with specific regard to Western economies. It outlines the advent, after industrial capitalism, of a new phase of the capitalist system in which the value of cognitive labour becomes dominant. In this framework, the central stakes of capital valorisation and forms of property are directly based on the control and privatization of the production of collective knowledge. Here, the transformation of knowledge itself, into a commodity or a fictitious capital, is analyzed. Building on this foundation, the authors outline their concept of ‘commonfare’. This idea of commonfare implies, as a prerequisite, the social re-appropriation of the gains arising from the exploitation of those social relations which are the basis of accumulation today. This re-appropriation does not necessarily lead to the transition from private to public ownership but it does make it necessary to distinguish between common goods and the commonwealth. This book explains this distinction and how common goods and the commonwealth require a different framework of analysis. This volume will be of great interest to all scholars and researchers, as well as a more general readership, who wish to develop a critical thinking of the mainstream analysis of this topic. Contributing to the "Marxism-heterodox" approach using rigorous theoretical analysis and empirical evidence, it is aimed at all those who act socially and aspire to a better understanding of the development and the contradictions of contemporary capitalism. Andrea Fumagalli is Associate Professor of Economics at the Department of Economics and Management at University of Pavia, Italy. He also teaches at IUSS Pavia and his research focuses on issues of labour precarity, on basic income and transformations of contemporary capitalism. Alfonso Giuliani is a Research Fellow at Centre d’Economie de la Sorbonne, Université Paris 1 Panthéon-Sorbonne, CNRS UMR 8174, France. His research focuses on issues of institutional economics, political economy of commons, cognitive capitalism, monetary theory of production, history of economic thought. Stefano Lucarelli is Associate Professor in Economic Policy at University of Bergamo, Italy. His research projects include institutional economics, cognitive capitalism, monetary theory of production, financialization, stock-flow consistent models and complementary currencies. Carlo Vercellone is Full Professor at Université de Paris 8, France, Department of Culture and Communication. He is also a member of Centre d'Études sur les Médias et l'Internationalisation (CEMTI) and Associate Researcher at CNRS- Centre d’Economie de la Sorbonne (CES). His research focuses on the knowledge economy, cognitive capitalism, welfare state and basic income.